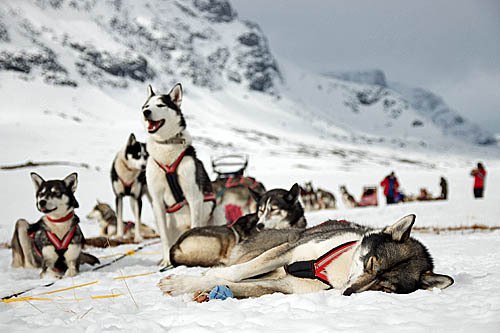 Meet the light and spring in the mountains of Lapland with our huskies. When most tourists have left and gone home, we start out on this season’s final spring adventure. The nights are bright, the migratory birds arrive and the reindeer herds have returned after their long migration from the forests to their calving land in the mountains. Among the locals here in the north it’s well known that the last weeks of the season can become the absolute best ones. The exact route for this tour will be decided after taking into account the weather and snow conditions at the moment. We will travel in both mountain and forest terrain, everybody driving their own dog sled. The setup is simple! We go for a real adventure, straight up on the mountain with our well-trained huskies. In the sledges we bring tents, gas stoves, dog food and everything else we need to make this a nice experience. We meet at Saltoluokta Mountain Station. Check in. You will meet the huskies and we eat a 3- course dinner together in the restaurant. We start the with breakfast at Saltoluokta Mountain Station before we go outside and make the dog teams ready. We explain how to load the sleds and why we are doing it in a specific way. How to drive and brake a sled, the simple commands and how we work with the dogs. Then we harness the dogs and hook them in in front of the sleds. In the coming days, we have different routes that may be relevant. We will decide where the route goes based on the prevailing weather and snow conditions, and in respect to the reindeer. There are four alternatives that are most likely. If it’s good snow conditions and the weather forecast looks promising, we will try to run all the way from Saltoluokta down to Jokkmokk and our kennel. This will be a journey of 220-250 km. Initially along the famous Kings Trail but then through The Pearl River Nature Reserve and east towards Jokkmokk. We will pass places like Aktse and the Rapa valley, Kvikkjokk the small mountain village at the end of the road, Årrenjarka and Lillselet which is one of few villages without road connection, and at the end come down to Jokkmokk. We will both stay in cabins but also stay several nights in tents. We travel east along the Great Lule river valley and then follow the winter trail north towards Tjuonajokk. Here we turn west and follow the Kaitum Rivers valley up until we reach the Kings Trail, then go further north to the classic area west of Kebnekaise. If there is a lot of snow we can go past the Kebnekaise Mountain Station down to Nikkaluokta and then southwards back over the mountain plateau towards Tjuonajokk and Kirjaluokta. Some years it is very little snow on parts of this route. If it’s less snow we will stay in the high mountains and run west towards Hukejaure and onward down to Sitasjaure and Ritsem. From Ritsem we will go by car down to Jokkmokk in the afternoon on day seven. in the lake Laidaures outlet. We will travel through the old primeval mountain forests in to the Manak area up towards the high mountains in the outskirts of Sarek National Park. We will end the tour in Kvikkjokk, Årrenjarka or other suitable place to be picked up by car to drive down to Jokkmokk in the afternoon on day seven. go by car down to Jokkmokk. beautiful nature types of Swedish Lapland with bare mountains, virgin mountain forests, river valleys, wide open plains and frozen lakes. If we were able to book the weather we would be happy if we could book different kinds of weather, everything from snowstorm to calm sparkling days with blue sky, so that you get to experience them all. Now it doesn’t work like that, so we must take the weather as it comes. During the afternoon at day 7 (if we haven’t run alternative 1) we will have a car transport down to Jokkmokk. Check in at Jokkmokk Hostel and eat a nice dinner together. After breakfast it’s time to leave Jokkmokk. You also need to have in mind that you will be physically active outside in the cold for many hours each day. Our tours are not made up touristic adventures but real experiences where everybody work as a team and helps with everything from taking care of the dogs, cooking, loading the sleds, fetching water and setting up tents etc. NOTE! The tour starts at Saltoluokta and ends in Jokkmokk.